Staples' Emily Ashken, blocks a shot from Wilton's Claire Detrick-Yee Tuesday. Askken scored a goal in the Lady Wreckers' 3-2 loss to Wilton. 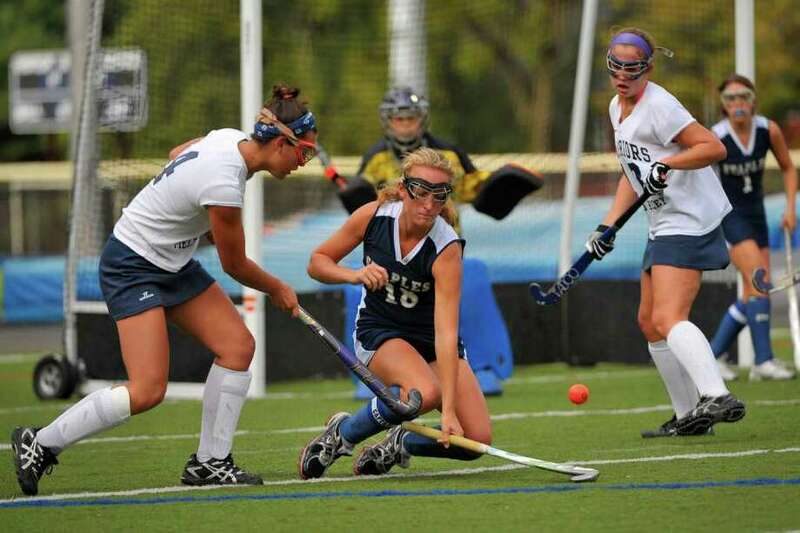 Even in defeat, the Staples field hockey team's progress is on display. Although Staples saw its four-game winning streak end Tuesday in a 3-2 loss at Wilton and dropped to 5-3, the Lady Wreckers left Fujitani Field with a lot to be proud of. One, Staples improved from its first encounter with undefeated Wilton (7-0) when it lost 3-0 to the Lady Warriors at Ginny Parker Field Sept. 13, and two, it outplayed Wilton, finishing the game with a 21-7 shots advantage. "The team did a good job keeping the field wide and reading the field," Lady Wreckers coach Cecily Anderson said. "The team did a good job keeping the field wide and reading the field. I think we should be proud of this game and not hang our heads. It was a really exciting game. Today's game was played with a lot of heart." Lady Warriors sophomore goalie Lizette Roman-Johnston was the difference with 14 saves, kicking out many shots she faced, some off of rebounds. Wilton took a 2-0 lead before Staples got on track in the first half. Sophomore Madison Hendry gave the Lady Warriors a 1-0 lead off a feed from junior Joanne Nazareth with 11:38 remaining in the first half, and senior Sarah Leffel made it 2-0 with 9:29 left off a pass from junior Valentina Tudisco. Two Lady Wrecker captains, Misha Strage and Emily Ashken, brought their team back into the game. "Misha Strage had one of her best games today," Anderson said. Ashken scored on a breakaway from Strage with 3:42 to go and Strage tied it 2-2 with 1:00 left from junior Megan O'Shea. "I really think we tried to go after every ball and create opportunities," Ashken said. "Misha was able to find me, I got by one defender, and I had a breakaway. Both of our goals were similarly scored on one-on-one plays with the goalie. If you go right or left or push it to the side, [you'll find the opening]." Anderson said, "I am really proud of my girls for being able to come back from a two goal deficit. It is really important to know that we have the ability to come back and not get out of the game. It took us a little bit to get into the game but once we did we had a many opportunities." And Staples took control after that. If it weren't for Johnston, the Lady Wreckers would have taken the lead in the second half. Staples junior Shelby Phares did a great job of coming back to the ball and giving everything she had, according to Anderson. Senior captain Callie Hiner also made a difference for Staples with her timing on tackling, sense of the field and pinpoint accurate drives. Lady Wrecker senior goalie Chris Lueb made four saves. However, Lueb couldn't stop Lady Warrior junior Caroline DeAngelis, who scored on a penalty corner from senior Claire Detrick-Yee to give Wilton a 3-2 lead. "Their goalie made great saves and Chris made great saves," Ashken said. "Their field was bouncy and it gave them an advantage. We adjusted and it was a great game. Their goals were on breakaway opportunities and they capitalized on their chances more than we did." Ashken takes some positives from the game but wouldn't call it a moral victory. She said, "It's tough to lose no matter what but I'm happy we played better than we did the first time around. It was one of our more aggressive games." Staples hopes to face Wilton in the FCIAC playoffs and it's confident that the third time is a charm. "I think it's very exciting, we had a close game with them and we are ready to play them again," Ashken said. "I think we can beat them. We're a great team and they are a great team. There's no reason why we can't beat them." Anderson said, "Wilton is traditionally strong and we really looked forward to playing them again. I hope that we see them again in the FCIAC tournament."